https://sep.yimg.com/ay/yhst-33477391359232/burgundy-linckia-sea-star-linkia-species-burgundy-sea-star-6.jpgBurgundy Linckia Sea Star - Linkia species - Burgundy Sea Star Expert Only!!! Taxonomy: Burgundy Linckia Sea Star belongs to the Kingdom Animalia, Phylum Echinodermata, Class Asteroidea, Family Ophidiasteridae and Genus Linkia. Scientific names: The scientific name of Burgundy Linckia Sea Star is Linkia species. Other common names: Burgundy Linckia Sea Star is also commonly known as Purple Sea Star and Tamarisk Sea Star. Origin or natural range: The Linkia species originates from the Indo-Pacific region including Tonga and Fiji. Size: Burgundy Linckia Sea Star may grow up to a size of around eight inches. Color: As the name suggests, the Linkia species is mainly Burgundy in color with the variations of deep purple to deep magenta. Aggression: Burgundy Linckia Sea Star is non-aggressive towards the marine aquarium invertebrates. Compatibility: The Linkia species is reef compatible. Venom status: Burgundy Linckia Sea Star is non-poisonous in nature. Habit & Habitat: The Linkia species is solitary in nature. Morphology: Burgundy Linckia Sea Star has five to six long and cylindrical arms. Tank type: To host Burgundy Linckia Sea Star, you should have a six months old Reef Type Marine Aquarium. The six months old tank would generally ensure the algal growth in it for the nutrition of the sea star. Keep sand or gravel, coral rubble, rocks and Live Rocks in your reef tank having the Linkia species. Better place one Burgundy Linckia Sea Star in a marine aquarium. Temperature of water: The temperature of your reef tank�s water should be maintained between seventy-two and seventy-eight degrees Fahrenheit. Specific gravity of water: The specific gravity of your marine aquarium�s water should range within 1.023 to 1.025.
pH of water: The pH value of your reef tank�s water should scale between 8.10 and 8.40. Illumination: The Linkia species requires ample lighting in the marine aquarium it inhabits. Acclimation: Slowly acclimate Burgundy Linckia Sea Star to your reef tank�s environment through Slow Drip Method. The slow acclimation process of the Linkia species takes a minimum time period of two hours. Diet: Burgundy Linckia Sea Star is Omnivorous in feeding habit. Food content: The Linkia species eats detritus and phytoplankton, mainly Film Algae. Supplements: You may supplement the diet of Burgundy Linckia Sea Star with dried seaweed and the meaty bits of clam. The Linkia species eats Film Algae and therefore, keeps your marine aquarium free of Film Algae infestation. Burgundy Linckia Sea Star eats detritus, thereby preventing the contamination of your reef tank�s water by keeping it free of perishable organic waste matter. The Linkia species is easy to maintain. 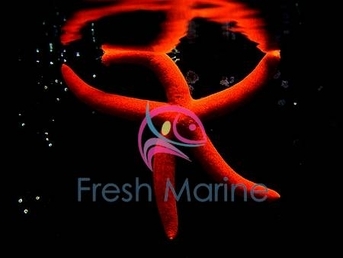 Sudden fluctuations in the pH and the temperature of your marine aquarium�s environment may give pH shock and temperature shock, respectively, to the Burgundy Linckia Sea Star therein. Copper and Nitrates in any form in your reef tank may prove lethal for The Linkia species. Exposing Burgundy Linckia Sea Star to air may be fatal for it. Therefore, keep the Linkia species under water even while handling it. Caution: Burgundy Linckia Sea Star may hurt clams, sponges and sea anemones. Therefore, do not keep the Linkia species with these marine aquarium invertebrates.